Ugh. It happens. Maybe it has even happened to you – and IT SURE AIN’T PRETTY! “IT” being (ominous drum roll – Da-Da-Da-DUM!). . . DAMAGE to our PRECIOUS SKIN as a result of SUN EXPOSURE. Thinning skin … Loose wrinkled skin… Uneven pigmentation… Dark spots… And, at the extreme end of the spectrum, the much-feared skin cancer. But the more sunny summers my skin sees, the more I feel a need to get serious about preventing, stopping, and reversing the sun’s attempts to sabotage my efforts of having the skin of my dreams. Are you too ready to "get serious" about the health of your skin? Want to make this the summer you turn it all around? You can! 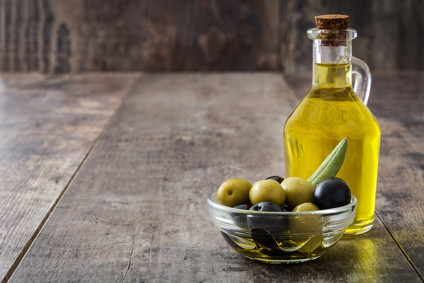 Olive oil is one of the richest food sources of a compound called squalene -- your new BFF when it comes to sun protection. It doesn’t actually block ultraviolet radiation. It simply makes radiation – whether UVA, UVB, or visible light – harmless to you, because it protects at a cellular level. In addition to taking care of those wrinkles, loose skin, and uneven pigmentation, squalene is also known to reverse coarsened skin texture. As a natural antioxidant, it controls free radicals, preventing collagen thinning and DNA damage that causes sun-related cancers and diseases including cataracts. Summer is the season of salads. Serving them up with an olive oil-based dressing will ensure a daily intake of squalene. 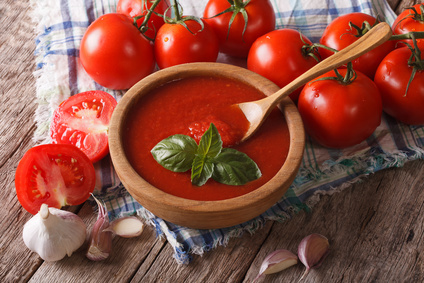 If you want to protect your skin from sunburn this summer, use tomato paste as your armor. Rich in sun-protective factors such as lycopene, phytoene, and phytofluene, tomato paste not only prevents the wrinkles caused by sun-damaged skin but those resulting from chronological aging as well! Combine it with olive oil for extra oomph – as in sauce or bruschetta. This combination can enhance collagen production. Check out the recipe at the end of this post for 2 Minute Ketchup. Onions, particularly red onions, are a rich source of quercetin, a flavonoid known to protect skin from UV damage. 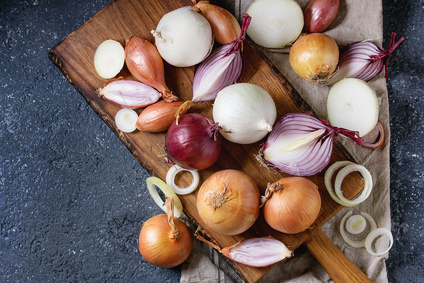 As if that wasn’t enough reason to eat onions every day, quercetin is involved in numerous cancer-blocking actions, including the reduction of estrogen hormone formation in fat cells. 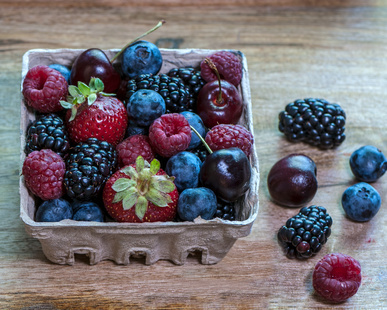 Berries are rich in an antioxidant called resveratrol. Resveratrol is like several anti-cancer drugs rolled into one, working in so many ways to block cancer, researchers can’t find a cancer-promotion pathway that it doesn’t inhibit. And while it is protecting your internal organs from potentially lethal carcinogenic changes, know that it is also keeping your skin healthy… and pretty. Berries – blueberries, blackberries, strawberries, raspberries… Taste their sun-kissed sweetness just as is – instant dessert! Or enjoy them like I do, in your morning smoothie. 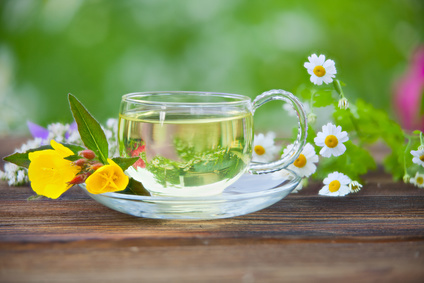 Green tea contains a polyphenal called epigallocatechin-3-gallate. (Try saying THAT five times real fast!) Or call it EGCG, for short. It’s the Ninja of natural cancer therapy, which is why I often recommend it in a concentrated, extract form as part of a recovery protocol. EGCG slows down sun-related skin aging, prevents skin cancer, and inhibits tumor cells when consumed on a regular basis. Green tea can be enjoyed as iced tea during the hot summer months. But stay away from those highly-sugared or sugar-substituted (just as bad!) green tea mixes you find on the grocery shelves. Make your own. Aim for two cups a day. The foods we choose each day can go a long way to creating smooth, glowing, youthful and healthy-looking skin. The best part is: over time, you may find that their effects are more than just skin deep! Combine ingredients in a small bowl. Whisk until thoroughly blended. To store, transfer into a glass jar. See how easy that was! Seriously, this takes almost no time at all and is very flavorful.